Average Weight	: 80 - 110 lbs. South East Bloodhound Rescue Inc. Throughout the world, breeds such as the American Coonhounds, Swiss Jura Hounds, Brazilian Fila Brasileiro, Bavarian Mountain Hound, and many others trace their lineage back to this ancient scent tracker. Today, all Bloodhounds are black & tan or red, but in the Middle Ages they were solid in color. The white variety, which existed in medieval Europe, was called the Talbot Hound and became extinct in the 1600s, but contributed to the development of many other breeds including the white Boxers and tri-colored Basset Hounds. The Bloodhound thrives on the hunt rather than the kill. It takes great pleasure in tracking and has been used to hunt animals, criminals, runaway slaves and lost children. Today this slow mannered, rich sounding breed is both tracker and companion. Although it has a pleasant temperament, it is not easy to obedience train, most likely largely due to the fact that it gets distracted from human command, more interested in all of the exciting strong smells around him. 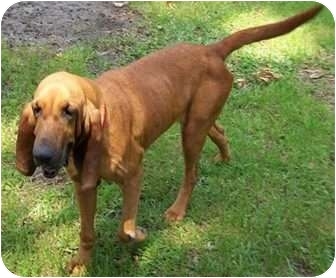 •	Bloodhounds are a very 'active' breed ~ not lazy. •	Require long daily walks/runs. •	Not suited for apartment living. •	As a 'pack' dog ~ get along with other dogs/pets in the household. •	Shed ~ a lot. •	Great with children, very tolerant. •	Require fenced yard. With their tremendous sense of smell ~ if they catch a 'scent' they're off on the hunt! •	Also require being on a 'leash' for the same reason: if they 'pick up a scent' ~ they'll be gone hunting it down. •	Have a history of ear infections. Need to routinely clean their ears. •	Docile, stubborn, determined, affectionate, shy personalities. •	Some, not all, can be vocal when excited. •	Can develop hip dysplasia.